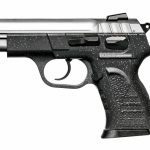 EAA is producing the Pavona pistol, a version of the CZ 75. The polymer frame is offered in different color/accent combinations to appeal to a broad spectrum of shooters. Note the thickness of the polymer frame and recoil spring guide rod. The slide rails ride inside the frame on the Pavona. The front dot sight sits atop a rib. The EAA Witness Pavona features a Novak-style rear sight. A beveled mag well aids in fast mag insertion. Note the curved trigger, mag release, slide stop and safety. 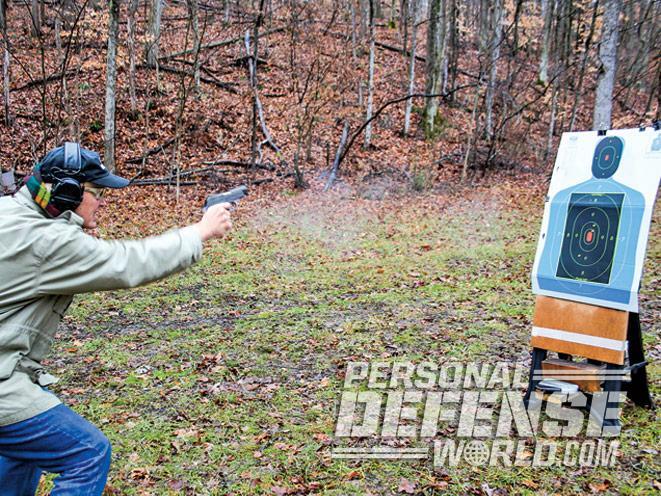 The author performed a practical shooting evaluation using a 30-round combat course starting at 3 yards. 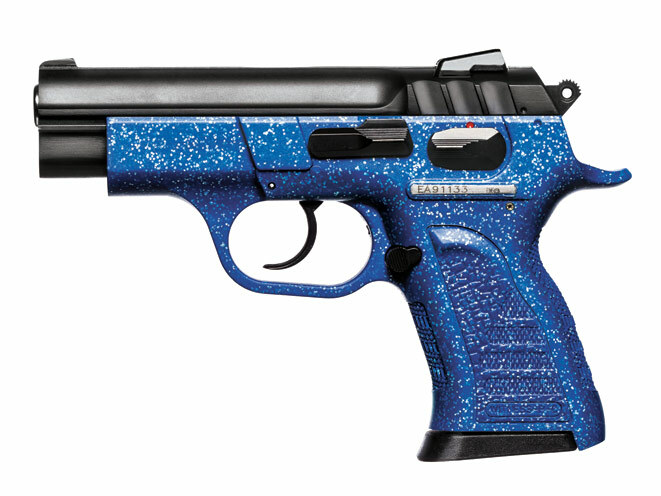 The most cloned semi-automatic handgun besides the Model 1911 is, arguably, the CZ 75. 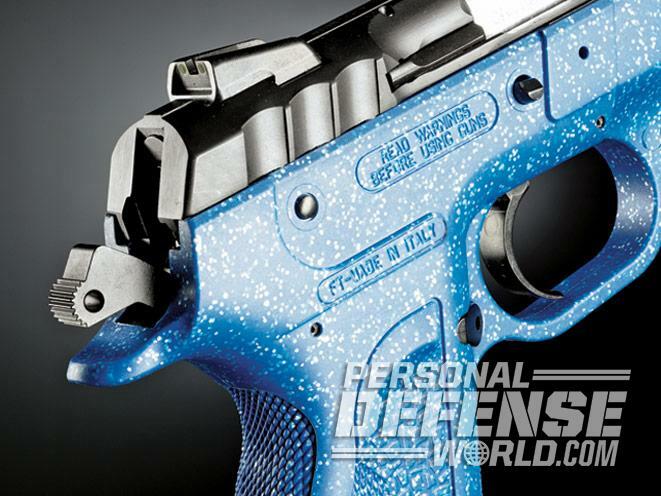 Although designed much earlier, the CZ 75 was not offered for sale in its native Czechoslovakia until 1985, where it became an immediate hit with sport shooters. 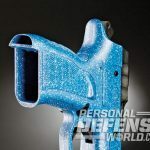 Envisioned as an export item, it was chambered for the 9mm cartridge and began to make its way outside the “Communist Bloc” as an expensive black market item. 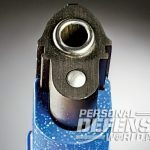 Two reasons for its popularity were excellent ergonomics combined with a feature previously seen on the SIG P210 pistol; the slide rides inside the frame on rails rather than outside, thus providing a tight slide-to-frame fit. This fit enhances the Browning-type short-recoil/locked-breech action found on the Browning Hi Power pistol. 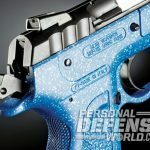 After the fall of the Soviet Union, the CZ 75 became available in the United States and other countries that had previously embargoed Iron Curtain exports. 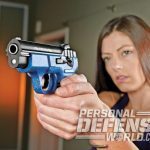 The pistol and its variations were reproduced by at least 12 different armsmakers in 19 different countries, and today it is used by many police forces, military units, sport shooters and those carrying a handgun for self-defense. 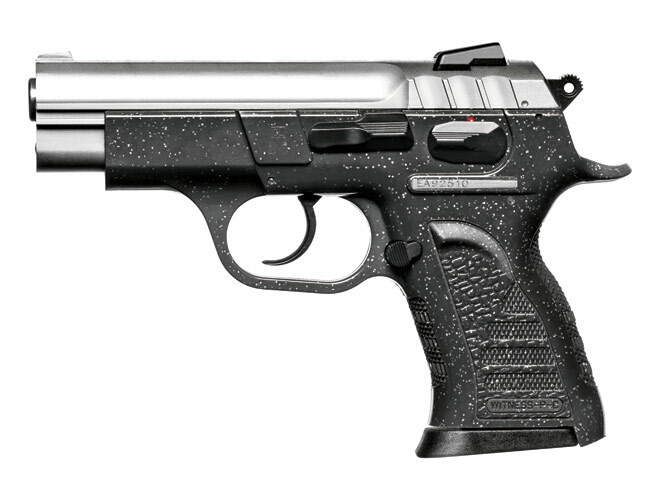 For a number of years, European American Armory (EAA) has imported an Italian copy of the CZ 75, the Tangfoglio T95, which has been marketed under the company’s “Witness” line of autoloading handguns. 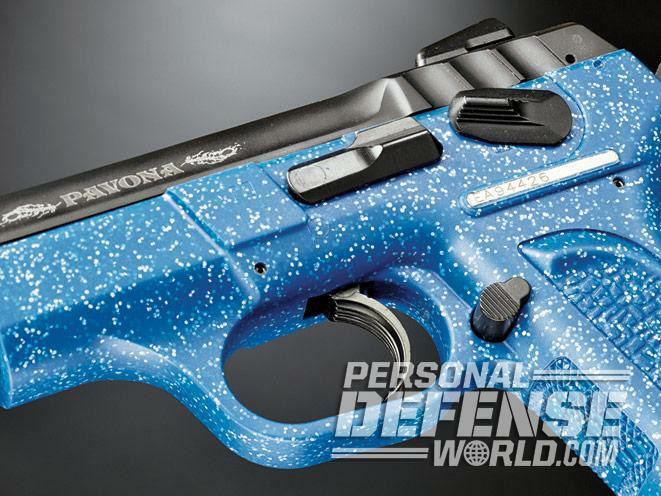 Recently, EAA expanded its Witness selections to include some pistols that would attract a broader spectrum of people interested in obtaining a handgun. 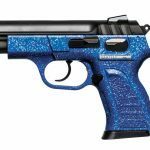 These new pistols would be classified under the heading of “Pavona,” and their most significant feature is the polymer frame that is available in various color and accent combinations that will appeal to both male and female purchasers. 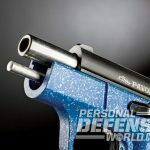 I saw the EAA Witness Pavona autopistols at a tradeshow earlier in the year, and as I was impressed with the handguns from a more practical standpoint, I asked to be sent a Pavona autopistol in 9mm caliber to test and evaluate. The pistol arrived in what looked like a fairly conventional black plastic carrying case—conventional, that is, until I popped it open. 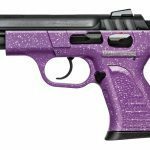 The inside was rather flamboyant to say the least, with a hot pink liner in the top and bottom, a foam rubber insert with cutouts for the pistol, an extra magazine, cleaning accessories, a padlock, a key ring and an empty chamber indicator/insert. There was also an owner’s manual and what looked like a credit card that can be used to record the gun’s serial number/model designation. I took a quick exterior inventory and didn’t see anything amiss as far as fit and finish were concerned. The Pavona variation I was sent was the Sapphire model, and as the name implies the frame has a blue coloration that has imbedded silver sparkles. Other colors available are Black, Imperial, Fandango and Charcoal. All have matte black slides except the Charcoal model, which has a contrasting satin chrome plating. 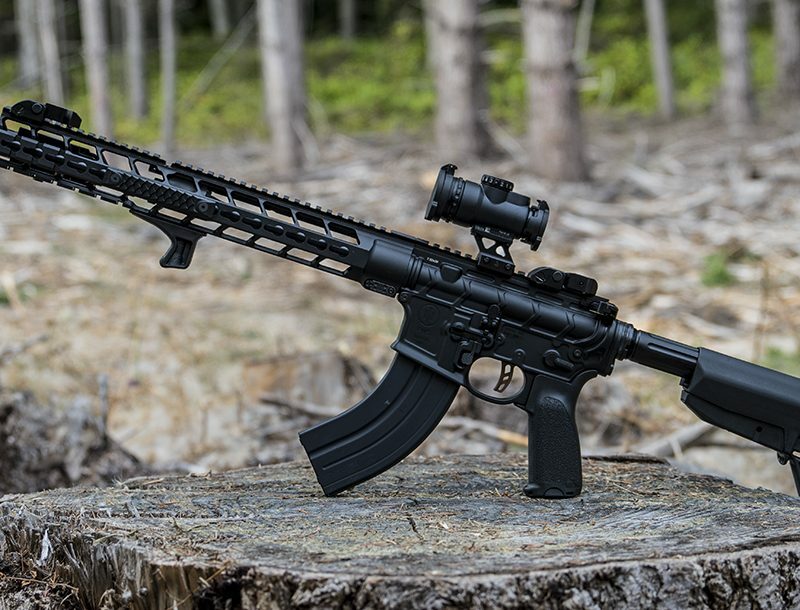 Now, from top to bottom, the Pavona has three-dot fixed sights, with the Novak-style rear sight mounted in a dovetail that allows for windage adjustment. There’s a narrow, slightly raised rib across the top of the sculpted slide that has had some metal artistically removed to improve the looks and cut down on weight. The rear of the slide is “scalloped” in place of conventional serrations and offers excellent purchase for retracting the slide. The ejection port is generous in size and the external extractor looks rugged. It has a smallish external hammer that is serrated to aid in manual cocking. On the left side of the slide is tastefully etched “Pavona” in gray letters. The 3.6-inch barrel is conventionally rifled, and the recoil spring beneath it has a full-length guide rod. 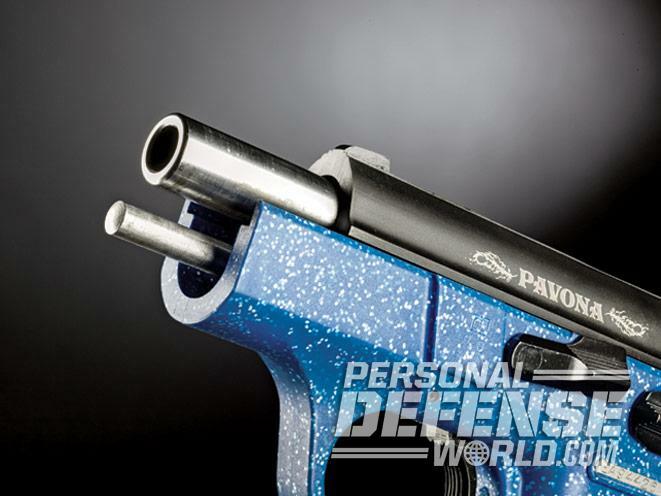 The test gun was in 9mm, but the Pavona is also offered in .380 ACP and .40 S&W. 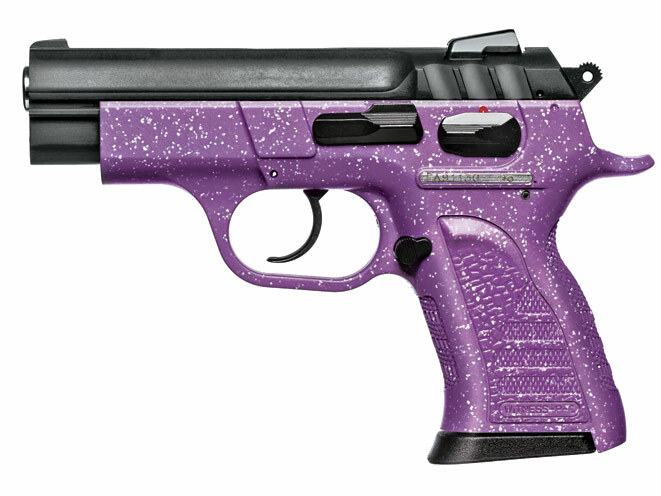 The .380 ACP and 9mm models have a 13+1 capacity, while the .40 holds 9+1. Due to the configuration of the slide rails, the frame looks a bit oversized, but this belies the overall compactness of the Pavona pistol. On the upper left of the frame are the slide stop and the safety. Note that the Pavona is a double-action/single-action (DA/SA) autoloader. It will fire DA with the hammer fully lowered, and you can drop the hammer as much as you want DA without cycling the slide. After the first shot in DA mode, it reverts to SA and the hammer will stay cocked until you manually (and carefully) lower it, as the safety does not act as a hammer drop. With the safety in the “up” position, you can carry the Pavona in Condition One (cocked and locked) if you so desire. The trigger is aggressively curved with shallow serrations that are not uncomfortable. There is no magazine safety or key-activated internal lock. The magazine catch is on the left side to the rear of the triggerguard and can be reversed. The integral grip frame is textured/checkered on all four sides and the shape of the triggerguard is rounded, plus there’s no accessory rail on the frame dustcover. The blued magazine has a wide polymer base that adds just a bit of length and “hook” to the bottom of the frontstrap. A special feature of the Pavona that I think we can all appreciate is the lightened tension on the hammer and recoil springs of the pistol. 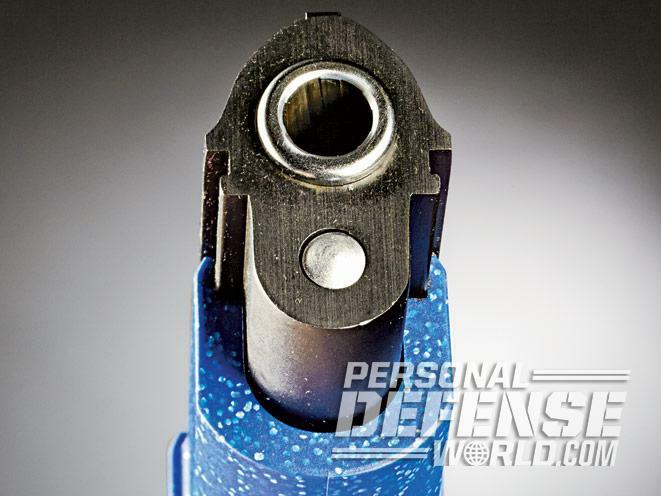 This makes the slide easier to retract for those with weaker hands, and the lighter hammer spring provides a somewhat reduced trigger-pull weight. I found the DA pull to be relatively smooth and estimate the weight at about 10 pounds. The SA pull has about 0.12 inches of take-up and noticeable creep before breaking at about 4 pounds, with slight overtravel. 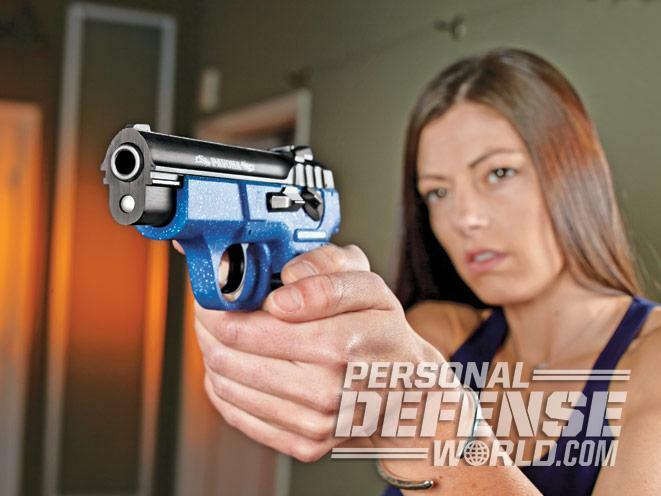 This is no striker-fired or DAO pistol, so if you’re going to select this type of handgun, you must be committed to learning the proper operation and handling or you’re asking for grief. 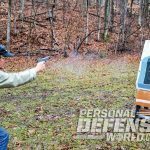 If you are not familiar with a conventional DA/SA pistol, then you’d best find a qualified or knowledgeable person to show you how to use it and then practice, practice, practice in both live-fire and dry-fire modes until operation is second nature. As far as test ammunition was concerned, I wanted to try some 9mm loads that are both conventional and unconventional. 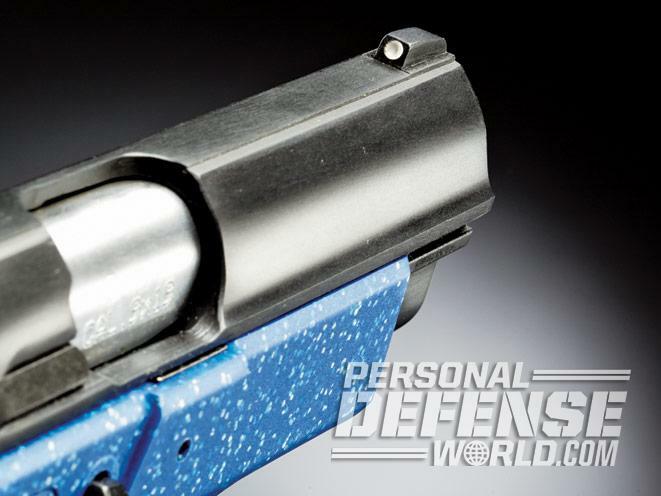 For home-defense use I picked a round that might just be a great “stopper” but would not overpenetrate and perhaps break up easier in sheetrock or other building materials. This would be the Civil Defense load from Liberty Ammunition. This round is produced from solid monolithic copper with nickel plating that offers lubricity and silver coloration. The hollow point is deep, giving the bullet a weight of just 50 grains, but the low weight and +P pressures give the velocity quite a boost. Penetration in bare ballistic gelatin averaged around 12 inches and the bullet splinters, creating a somewhat star-shaped permanent cavity as the bullet expands and the “petals” break off the base. I’ve used the .40 in a previous test and was impressed with the accuracy and performance. I also included DoubleTap Ammunition’s 9mm +P with a 124-grain jacketed hollow-point (JHP) bullet. This is another hot load, but with a more conventional bullet driven to magnum-like velocities. It looks like it probably is a Remington Golden Saber brass JHP, and it has a good reputation as a stopper. Lastly, I chose the Winchester Ranger LE load that carries a T-Series JHP bullet weighing 147 grains. 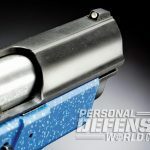 This bullet weight became popular for the 9mm following the “Miami Massacre” in 1986 and worked pretty well; it looks like it might be making a comeback, so I included it here. 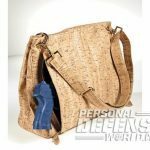 EAA offers the Pavona in a Carry Purse Combo. This includes the option for several different handbag designs in styles like the Messenger Purse and the Compartment Purse. These also come in several textures and colors to suit individual taste. I checked out a Messenger style bag with the look of natural cork material. This large (14.5-by-4.75-by-11.5 inches) bag could just about pack a laptop, and has four zippered compartments inside and out, plus an adjustable shoulder strap. Large zippers on either end give access to a 13.5-by-9-inch compartment lined inside with Velcro “pile” material. 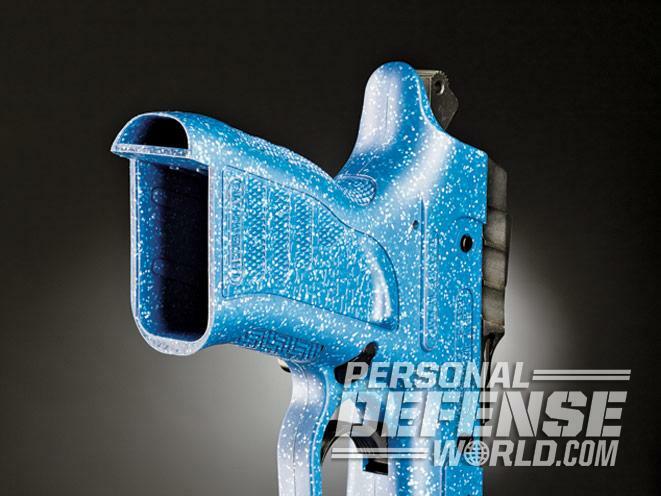 This lining allows the user to creatively position a polymer retention holster that has “hook” material attached to both sides. The holster is exactly molded to the Pavona for a firm hold, yet it yields the pistol freely when drawing without pulling loose and coming out of the purse. A large flap with a magnetic closure covers the purse interior, and sewn into the black cloth lining is a pouch that will hold two extra magazines. I experimented with the Messenger purse, and found it worked out rather well when wearing it on the left side and removing the Pavona in a crossdraw fashion. The big flap was easily lifted for quick removal of extra magazines. 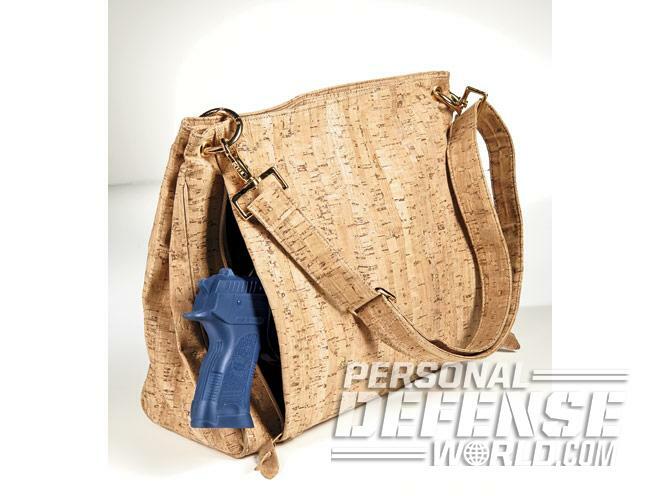 If you get the Carry Purse Combo, it comes with your choice of purse style and a 9mm Pavona pistol. Range day proved a bit daunting at my outdoor range with cloudy skies and light rain combined with wind gusts and cool temperatures. As I’d previously chonographed the test ammo, I got down to the “paperwork” and put up some targets out at the 15-yard mark and prepared to shoot three, 5-shot groups with each test cartridge. Shooting was done in the SA mode from the bench using a sandbag rest. Even in the reduced overcast light, the sights were easy to pick up. The two 9mm +P loads produced some pretty noticeable muzzle flip, but recoil wasn’t bad with any of the three, and the Winchester Ranger was a pussycat. It also gave the best performance with a 1.44-inch best group and a 1.62-inch average. None of the groups approached the 3-inch mark, and you can see all the results in the table. I was wearing my old Army field jacket and decided that, as many an Old West lawman had done, I was going to utilize pocket carry for the Pavona and extra magazines, of which I had two. The practical shooting course I often use is the combat qualification course I used to shoot as a Customs & Border Protection officer. 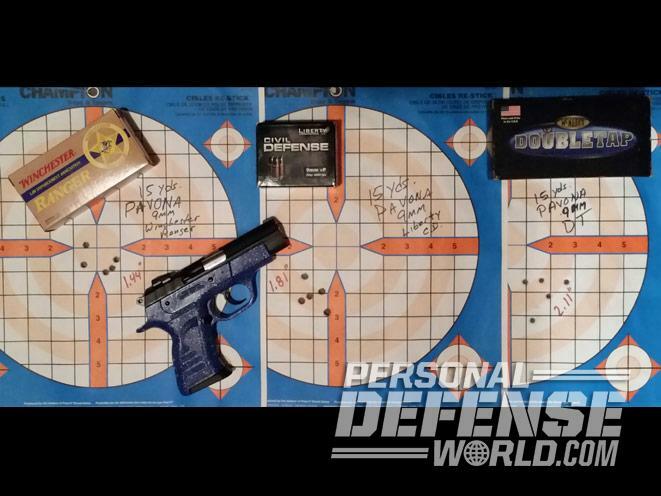 It’s a simple 30-round exercise with shooting at the 3, 7 and 15 yard lines, and it’s perfect for compact handguns as the Pavona is very close in size to the HK P2000 that was my duty gun. Each magazine was loaded with six rounds of Winchester Ranger 9mm ammunition; one placed in the gun and my two extras oriented properly in my off-side jacket pocket. I’d put up a B27-type silhouette target at 15 yards and then walked out to it, taking a position 3 yards away. 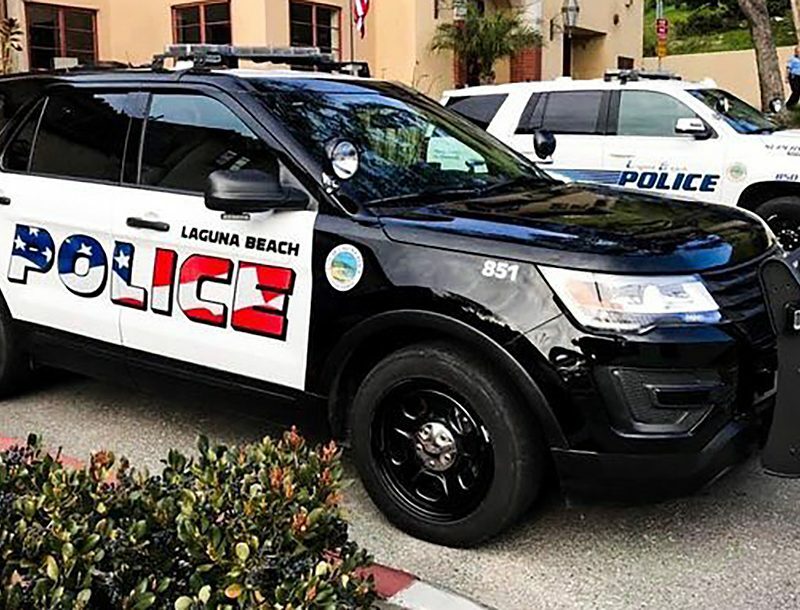 The Pavona was set to fire DA, and I drew it from the pocket and, shooting with the strong hand only in a point-shoulder stance, squeezed off six rounds, dumped the empty magazine, loaded another and fired six more shots using only the support hand. I again did a combat reload, and then loaded six more rounds each in the two magazines and pocketed them. I moved to 7 yards, drew and fired three sets of double-taps, then reloaded. Next I drew and fired two shots center-mass and one to the head, twice, for a body armor drill. 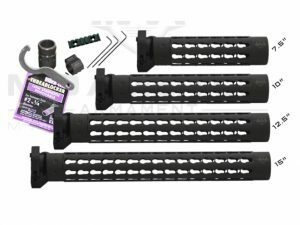 Finally, with my last magazine, I moved to 15 yards and from a barricade position fired two shots standing from the right side, two from the left side, and then two from the right side while kneeling. Out of 300 potential points, I scored 296 and 19 “X” hits. During my evaluation, I had zero malfunctions with the Pavona. Like its parent CZ 75, I found the ergonomics excellent. Magazines dropped free when ejected, the controls were easily reached and utilized, and the gun fit well in my medium-sized hand. Its “pointability” was outstanding. 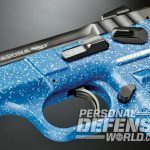 Given its accuracy potential in 9mm, it should be very effective with proper shot placement, and I would feel well armed indeed with the Pavona in a holster or handbag! For more information, visit http://www.eaacorp.com or call 321-639-4842.